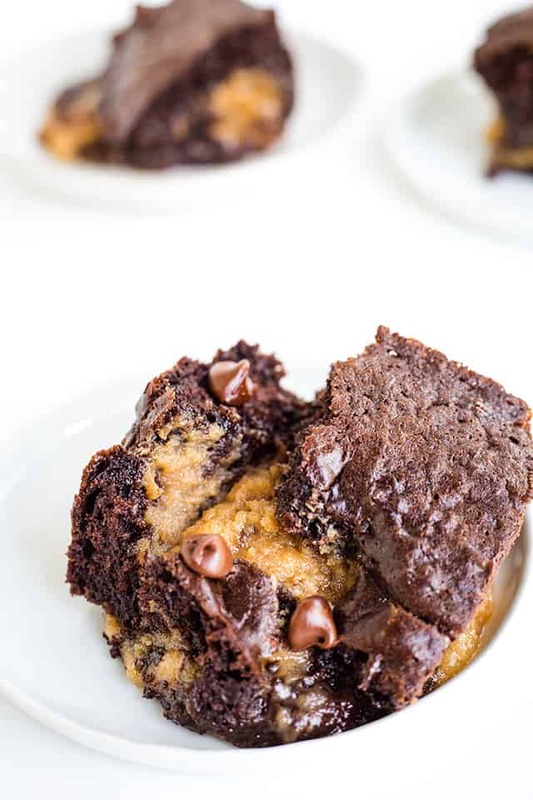 Do you love chocolate peanut butter desserts?! 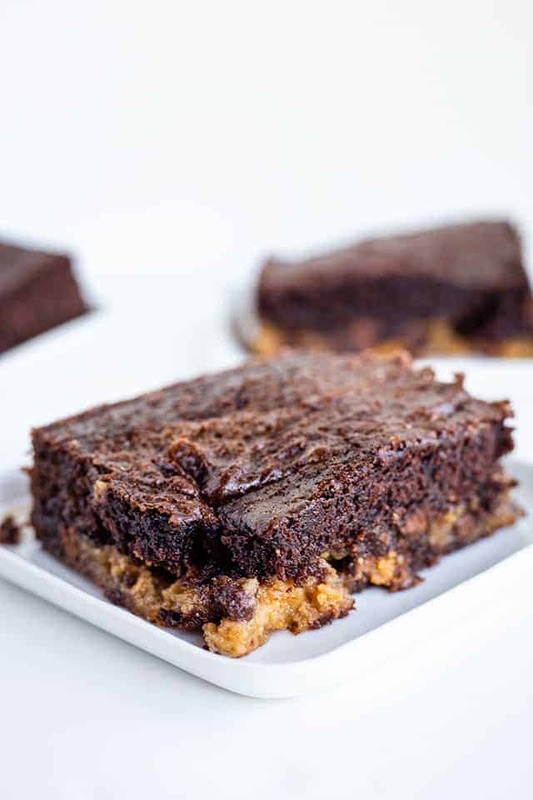 This decadent chocolate peanut butter earthquake cake is your dessert. 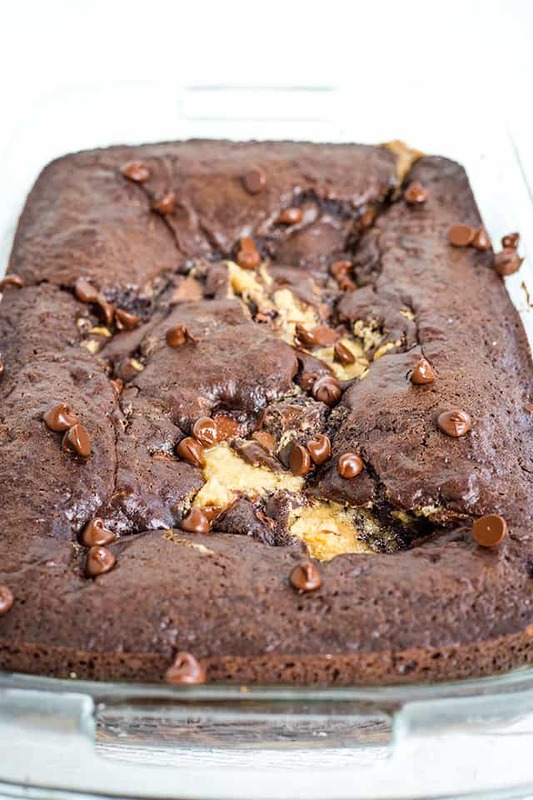 Chocolate cake loaded with peanut butter cheesecake, peanut butter cups, and milk chocolate chips all stuffed into one dessert. No need for frosting here! 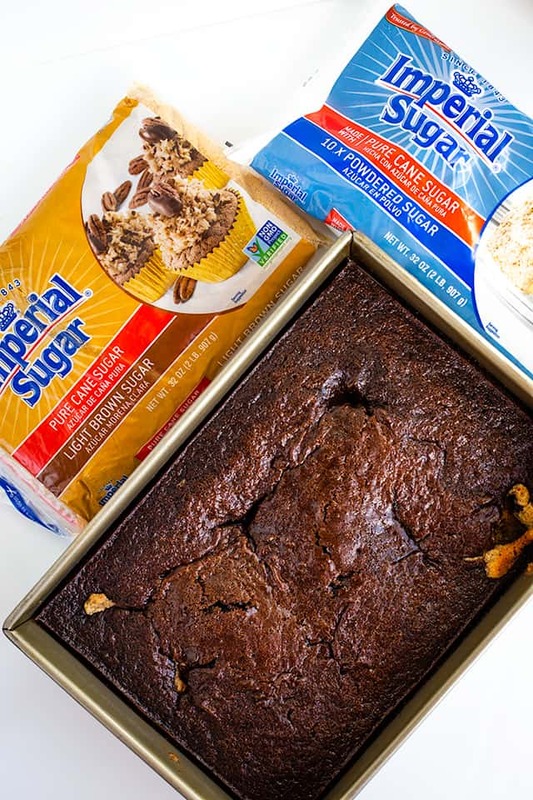 Our gold sponsor, Imperial Sugar, has sponsored me for this #choctoberfest post. All opinions are my own. Remember to enter the giveaway over here. 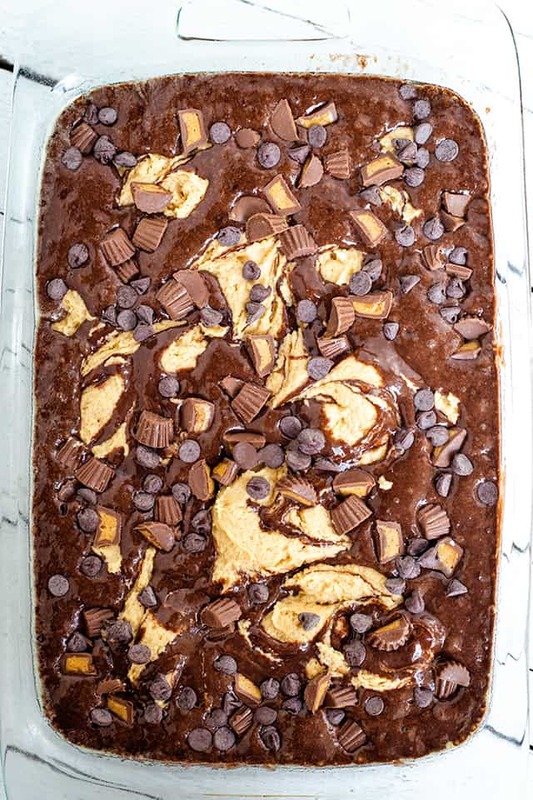 I can’t even tell you how many times I’ve made this chocolate peanut butter earthquake cake. Totally lying, it’s been 6 times now. I tested it a couple of times, made it for my mama’s birthday and she absolutely went crazy for it, made it for a video and then made it again for a video because my dog ate the first one. I wish I was joking but it happened and I had no idea until the next day. I left my studio open when I went to pick my husband up from work because one of my kitties was laying in there and Ferdinand helped himself to an entire cake. I know that dogs can get really sick from eating chocolate, but he’s been to the vet and he’s healthy as a horse. Thank goodness. I’ve tested this recipe with a couple different amounts of peanut butter cheesecake added to them. I really liked them both, but more is more with me. 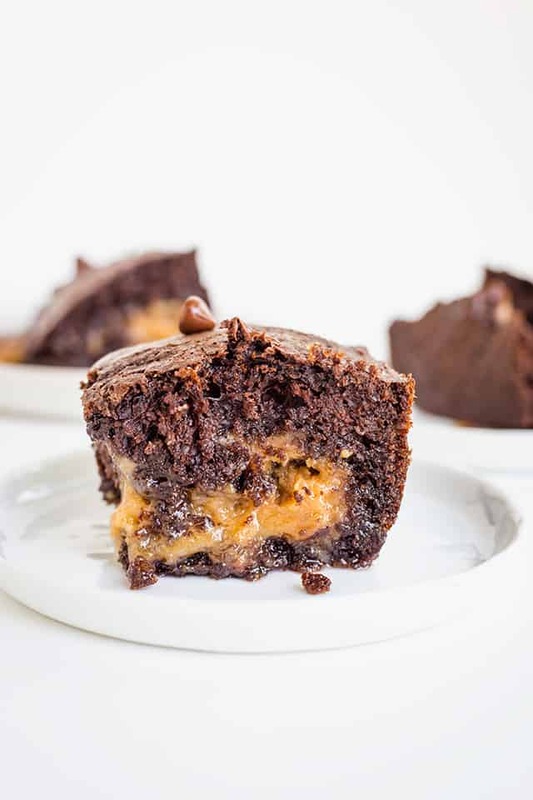 So, if you want the extremely gooey chocolate peanut butter earthquake cake, double the peanut butter cheesecake recipe! I used a chocolate fudge cake mix for this recipe, but you can use the cake recipe in this Decadent Triple Chocolate Cake instead if you want it completely homemade. I know I’ve said it before, I have people compliment my cakes even when they’re just cake mix cakes. If you can throw an amazing frosting on top or in this case a peanut butter cheesecake filling, you’re all set! 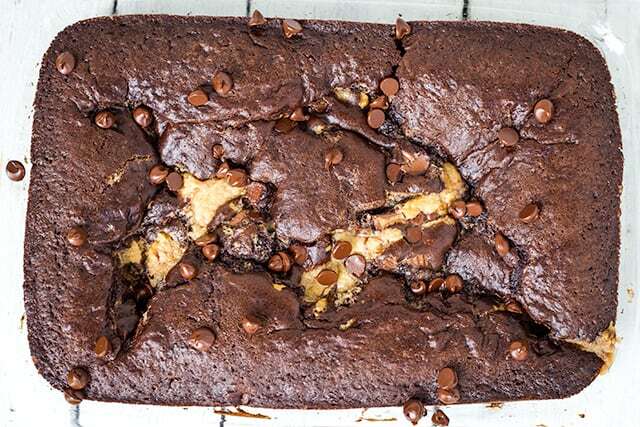 How gooey do you want your chocolate peanut butter earthquake cake? 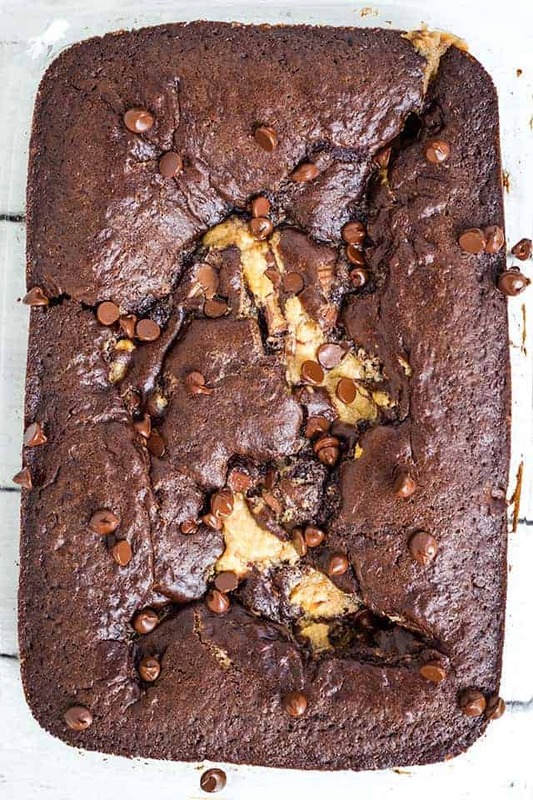 Do you want it over-the-top gooey where you may have to use a spoon to scoop out your cake? Double JUST the peanut butter cheesecake recipe! It makes the cake look a lot more like an earthquake cake too. To make the peanut butter cheesecake filling, you’re going to need exactly what you need to make a peanut butter cream cheese frosting. The only difference between the two is that we’re adding it to the cake batter instead of a baked cake. I used Imperial light brown sugar and powdered sugar to make the peanut butter cheesecake filling. I added the light brown sugar because I’m a sucker for peanut butter and brown sugar together. It just gives it a little extra flavor and richness. The powdered sugar added the additional sweetness that was needed without making the cheesecake filling too grainy. 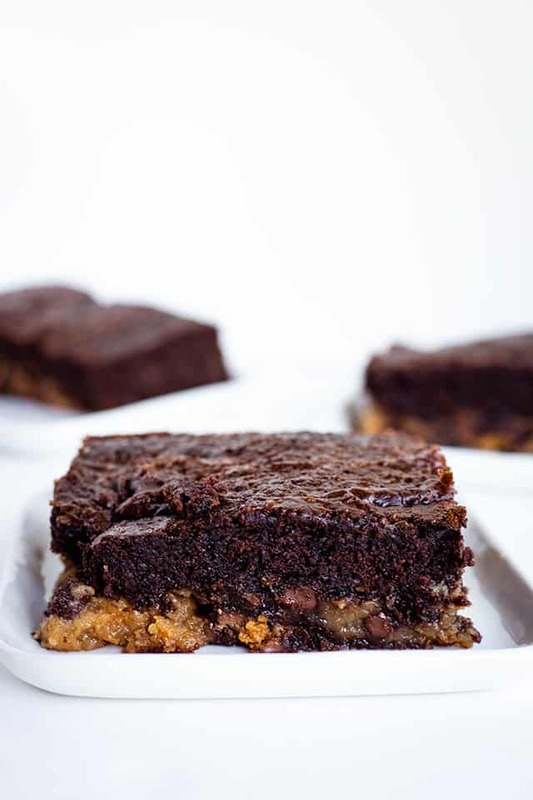 The last thing we needed for the chocolate peanut butter earthquake cake is peanut butter cups and milk chocolate chips. The milk chocolate chips can be substituted with semisweet if those are the chocolate chips you prefer. I’ve never been a semisweet chocolate chip lover. It’s just not sweet enough for me. ⬆️⬆️⬆️ This is an example of the chocolate peanut butter earthquake cake with the peanut butter cheesecake doubled. See how gooey it is? Heavenly! ⬆️⬆️⬆️ Here it is made according to the recipe below. Still gooey, but not to the point where you’re spooning it out of the cake pan. Want more chocolate peanut butter desserts? 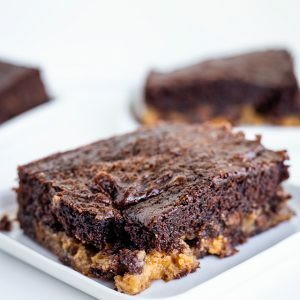 This decadent chocolate peanut butter earthquake cake is a chocolate cake loaded with peanut butter cheesecake, peanut butter cups, and milk chocolate chips. No need for frosting here! Preheat oven to 350 degrees. Spray a 9x13 cake pan with nonstick cooking spray. Pour into the prepared pan and set aside. In a medium mixing bowl, add in the butter, cream cheese, and peanut butter. Beat on medium with a hand mixer until creamed. Add in the brown sugar, powdered sugar and vanilla extract. Beat on medium until combined. Scoop spoonfuls of peanut butter cheesecake filling all over the top of the cake batter. Make sure to distribute the filling pretty evenly. Sprinkle the chocolate chips and peanut butter cups all over the top of the cake and peanut butter cheesecake filling. Place into the oven and bake for 45 minutes or until done. Insert a toothpick and if it comes out clean or with moist crumbs, the cake is done. There may be some chocolate from the chocolate chips but it will look like melted chocolate rather than cake batter. Cut and serve! Store in the fridge. Double the peanut butter cheesecake for a gooier cake!